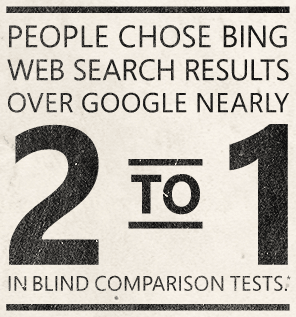 Bing it on, (the side by side search on) is a new challenge for Google as people have voted for Bing 2:1 in Blind comparison tests. Bing, the second most popular search engine in the world has taken a new step to compete with the search engine giant- Google. Bing it on is a blind comparison test which allows people to search queries using both the search engines, Google and Bing. It is more like a test and surprisingly Bing has been voted better in this comparison test. Bing has been putting in a lot of research in the area of providing the most relevant results to the user. Now, it has presented the user with a tool to see,experience and compare the results shown on both the search engines, i.e. Google and Bing. As you can see from the above image, Bing displays a side by side comparison of search results displayed by both Google and Bing. Users must choose the best results by ticking on "Results on the right" option or the "Results on the left option" respectively. There are total five rounds in the test and the result is shown after the test (i.e. five rounds of query searching) is involved.